What If your photos can't display? Learn why your phone can't display photos and how to fix it. 1.Photos taken by camera: [camera/pictures]. 2.Videos taken by camera: [Videos]. 4.Photo taken of me by yourself: [Selfies]. 5.Third party apps will preserve pictures in their respective folders. For example, the pictures preserved from Facebook will saved in a photo album named [Face Book]. 6.Files received from Bluetooth: [Bluetooth]. 7.Recently deleted pictures within 30 days: [Recently Deleted]. * When your photos are saved in the TF card, connect the TF card to your computer and check if it is working; if yes, deal with the following instructions. 1. Go to [Files] > [DCIM]: Try to look for the photos, if you preserve them in TF card, then you can search them in TF card. 2. If you can view these photos in [Files], revise the preserve folders and transfer them into [DCIM]. If you failed to transfer the files, you can try to copy them to computer. If your photos still can't open in computer, that means your files have been destroyed. If the phone alerts you "loading thumbnail photos failed"
1) Go to [Settings] > [App Management]> [All] and find Camera. Click Camera, clear its data and cache, then restart your phone. 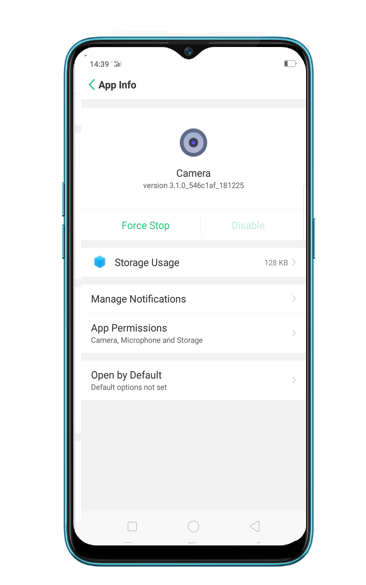 * ColorOS 5.2: Go to [Settings] > [Application Management]> [All] and find Camera. 2) Go to [Settings] > [App Management] > [All] and find Photos. Click Photos, clear its data and cache, then restart your phone. 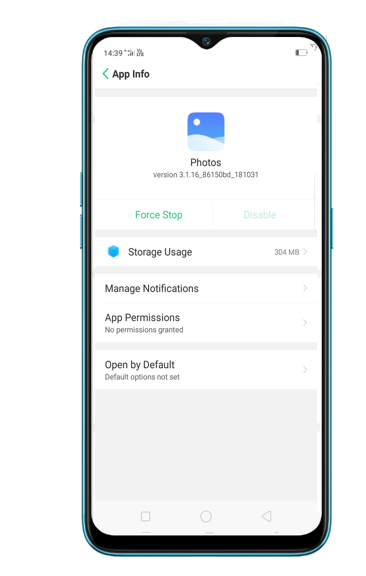 * ColorOS 5.2: Go to [Settings] > [Photos], click Clear cache, then restart your phone. This can make images load faster. 1. Alter the preserve folders: try to put photos in the root directory or in TF card. 2. Try to delete some photos when you have preserved too many files, then reenter album and load photos again. 3. If the storage space is insufficient, back up files to the computer and delete those on your phone to free up more storage space. 4. Can't solved: backup your Contacts and Messages and restore your phone to factory settings or update to the latest software version.